Whenever you walk past a restaurant in the street, do you wonder how old it may be? Are you trying to imagine what did it look like 10, 30, 100 years ago? What foods did the restaurant serve? Who would visit it? How popular it once was? Frankly, we do. And that is the reason why we decided to introduce you to the best restaurants in Bratislava that literally survived decades. Some of them still keep the same name, the others transformed from a socialist sounding one to a fancy international name. Here is the first one you shouldn’t miss on your trip to Bratislava. Savoy restaurant can be found on the ground floor of the Hotel Carlton in Hviezdoslavovo square close to the Old National Theatre and Slovak Philharmony. Although restaurant with iconic name opened only in past year, this place has a real history of meeting spot for foodies. Its roots date back to 13th century. Back then you could find here a popular tavern Swan’s. Without any potatoes in our cuisine back then, mostly served would probably be wheat products. Later, in the 18th century a new resthouse By The Three Green Trees opened it gates to public, welcoming and refreshing not only hungry and thirsty travelling businessmen, but also their horses. Popular resthouse was later rebuilt into a three – storey hotel By The Green Tree. Even the Franz Joseph I, the Emperor of Austria, stayed here for one night and supposedly loved the breakfast served, as is stated in an ancient hotel book. Competition in the old Bratislava (the truth is at the end of 19th century literally no one knew Bratislava – the name of our capital was either hungarian Pozsony or german Pressburg) was pretty tough and one of the biggest competitors was hotel National with its lovely café Savoy. Yet, hotel By The Green Tree triumphed with first cinema in Slovakia. It had a complicated futuristic name Elektro Bioskop. 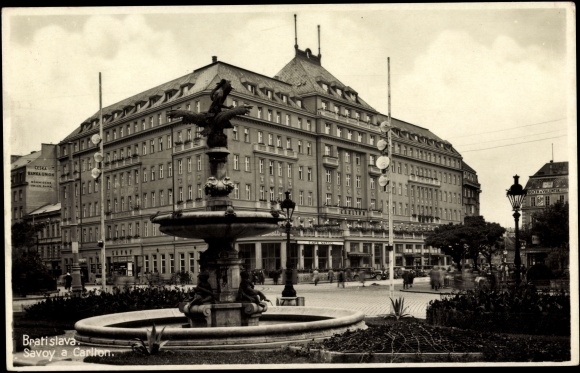 In June 1913 hotel complex Savoy – Carlton was opened after uniting three hotels in nearby area. As a result he cinema moved to a building in the neighborhood. With a promising name “Mladosť” (Youth), you can find it in Hviezdoslavovo square 17 still playing about four movies a day. Yet, Savoy – Carlton was technologically very sophisticated with its fridges, freezers and even hot water preparation. 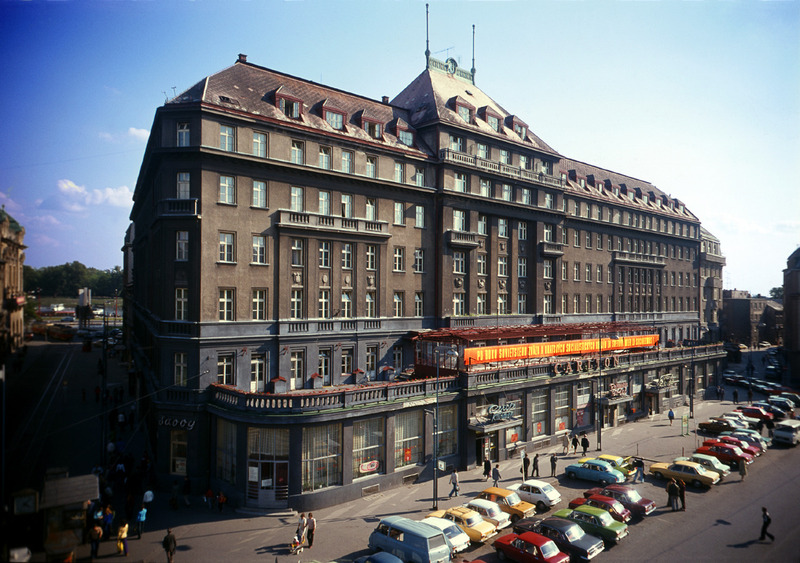 Finally, after reconstruction in 1925 – 1929 Savoy – Carlton with its 400 beds became the biggest hotel in central Europe. Its Carlton café was a meeting place for intelligence, lawyers, doctors, engineers, professors and businessmen. These would come to read the morning news by a cup of coffee or spend the Sunday morning here (naturally, women had to stay at home cooking lunch – thank you, guys!). In the hotel book names such as Thomas Alva Edison, Albert Nobel or even Theodore Roosevelt can be found. Who knows which delicacies did they savour here? On the other hand, nearby Savoy café used to be a melting pot for different social group, mostly young university students and gay community of Bratislava which occupied one corner of the café. 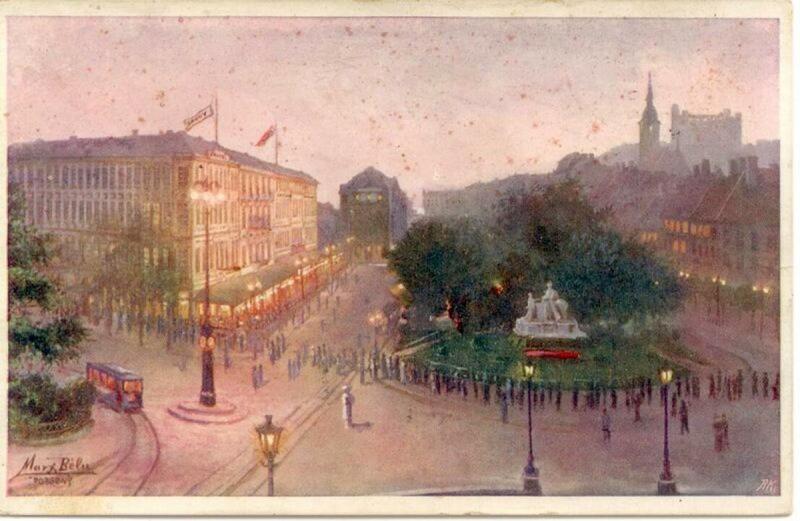 Besides that, more eateries were situated in the hotel – from cheap bistros to a luxury French restaurant. Source: www.historicky.sk Sign on the front: Side by side with Soviet Union and related Soviet countries for world peace and socialism! History sounds great, doesn’t it? However, in fifties Savoy – Carlton sadly downgraded to an average-type accommodation. By the end of eighties the whole hotel was so devastated that it had to close down. Hotel Carlton reopened in 2001 and it is a part of Radisson Blu chain with its 4 stars. Today, Savoy restaurant serves traditional Bratislava (rather Pressburg or Pozsony) cuisine full of seasonal vegetables, mushrooms, freshwater fish and meat from local producers or nearby woods. Iconic Slovak restaurant is situated on the ground floor. 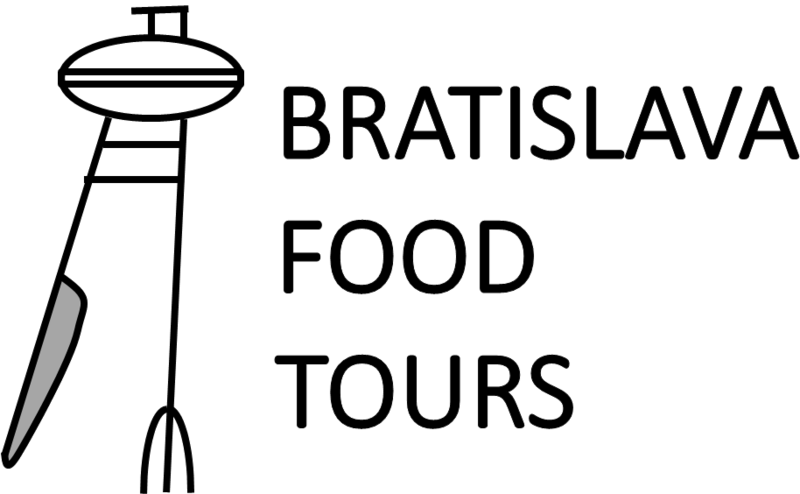 Foodies from Bratislava Food Tours (a.k.a. 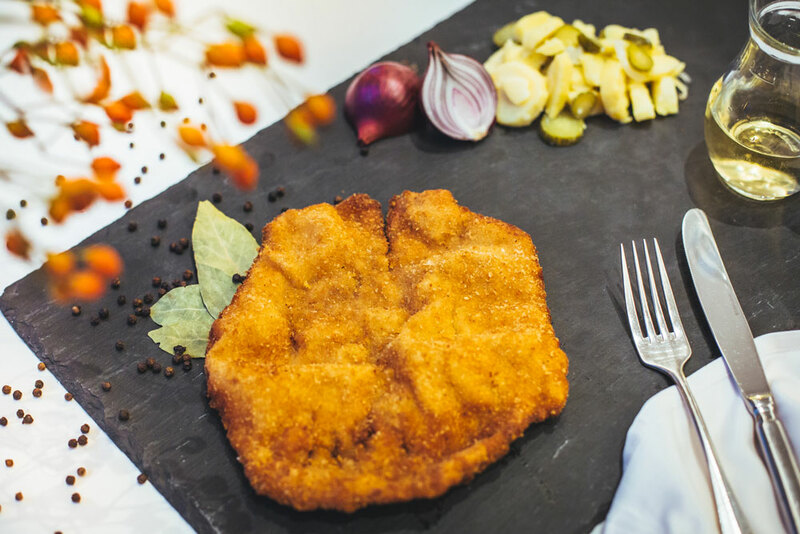 our guides) especially recommend Pressburger Schnitzel – made according to original recipe from veal marinated in white wine with crunchy potato salad or deep fried kohlrabi, beef goulash and baked trout. If you happen to be in Bratislava with your hungry family on Sunday, do not miss three- course Sunday lunch for two adults and two children (up to 10 years of age) for 39€ which is a reasonable price for such a piece of mouthwatering history!